I make work with primordial intentions, working instinctively at each stage with the goal of knowing experience. I use a process that leaves the possibility of achieving an image open and uncertain. I rely on my body and its wisdom. 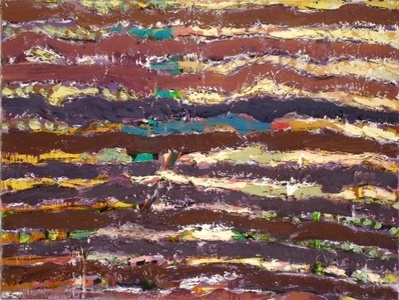 In this regard I have been influenced by the contemporary Australian Aboriginals and their processes; for example, I lay my surfaces flat when I work, often sitting with the work on the floor. I listen to what comes by attempting to discipline myself to remain in the moment, attentive to what is happening on the surface. What come’s takes many forms, from remembered moments experienced to particular light conditions, familiar shapes or a spatial feeling that I know. These disparate elements may come from different points in time or different events yet in the moment in the studio relate. I have a need for resolution, and I’ve discovered that through working in the studio with materials I am able to find this resolution anew with each new work. I go through a process of re-determining my beliefs and rediscovering what it is that I hold to be true concerning a constantly changing and expanding number of qualities; like color, mark making, structural organization and the space that is evolving within the painting. I get a fleeting sense of what I believe each time I am fully engaged with the materials of paint and charcoal, however I must do it again or that sense that I had passes and feels lost to me. What happens within this space is something that I get to know more about as the painting progresses, and get to know again and again with each new work. Characters form relationships and narratives between these develop. Language evolves out of the process of clarifying these relationships codifying these experiences; these memories and how they relate. Specificity is the degree of intimacy I am able to achieve with the remembered experience, whether I am able to be at one with it, knowing it and make it live as an experience again through paint.